The trip to Winnemucca Lake is a favorite by many Tahoe locals. It’s a relatively short, but rewarding adventure with excellent views in all directions. You can see Caples Lake, Red Lake Peak, Elephants Back, Round Top, and Freel Peak and Little Round Top (if you have a clear enough day). You’ll also travel past Frog Lake which is a nice place to take a short break. There is good fishing at Winnemucca Lake in the summer, and you’ll be on the right track traveling along this trail if you are hiking either the Pacific Crest Trail or Tahoe-Yosemite Trail (just know they diverge at mile 1.3). In the winter, this route provides access to great, but technical cross-country skiing, as well as backcountry alpine skiing (namely Elephants Back and Round Top). Click on the above map to enlarge it for better viewing. Elevation along the route is indicated by color (green=lower elevation, red=higher elevations). This map is only for reference and shows the hiking trail to Winnemucca Lake. Always carry a traditional topographic map and compass when traveling in the backcountry. Park at the Visitor’s Center/Sno-Park at the top of Carson Pass in order to travel south. There’s another parking lot just around the corner on the north side of State Route 88, but only use it if the Visitor’s Center lot is full (or if you plan to travel north from Carson Pass). Crossing the road can be dangerous due to the serpentine nature of State Route 88 and resultant blind corners. In the summer you’ll need to pay for day use parking (at the south or north parking lots), which was $5 in 2017. Probably bring at least $10 in cash ($5 and $1s) just in case the price changes. For winter travel you will need a Sno-Park permit ($5/day, $25/season). The permits can be purchased in Meyers or South Lake Tahoe (not at the actual Sno-Park) and they will save you the $100 ticket if you park without a permit. If the Carson Pass Information Station is open while you’re at Carson Pass, stop in and check out their selection of books and maps. Lots of cool stuff to get you interested and more informed about the flora/fauna and history of the region. The trail to Winnemucca Lake is mostly uphill, so be prepared for some elevation gain. The trail is hard-packed and obvious in the summer. And because it’s a favorite trail for many people, I recommend arriving early at the trailhead to guarantee finding a parking spot as well as to avoid any crowds. The trail travels through diverse terrain, including forests and exposed rocky and grassy fields. For many weeks during the summer months, the trail is lined with multiple varieties of Sierra Nevada wildflowers. Please note, however, that because this location sits above 8,000 feet, the snow tends to remain later in the summer. Therefore, most of those wildflowers will appear well into June and July, whereas at lower elevations they’ll start showing up in May. Once you travel past Frog Lake, you’ll be exposed to the elements. The wind can be quite aggressive by the time you reach the Pacific Crest Trail at the Elephants Back junction, so bring extra layers and sun protection if you plan to spend the whole day out there. The first 1.3 miles south from Carson Pass is the actual Pacific Crest Trail, but then it branches off from the route to Winnemucca Lake taking you west of Elephants Back. This intersection is also where the Pacific Crest Trail and Tahoe-Yosemite Trail diverge. Continue straight along the trail to arrive at Winnemucca Lake. Then, you could travel further along this trail to Round Top Lake, Fourth of July Lake, and way down into Summit City Canyon (which is the Tahoe-Yosemite Trail route). The trail to Winnemucca Lake on September 29, 2015. Round Top is the prominent peak left of center, while The Sisters or right of Round Top along the ridge. © Jared Manninen. During the winter, the actual trail is less obvious but it sees a lot of use so most likely there’ll be some clearly laid tracks upon your arrival. That said, there are some challenging sections early on with regard to cross-country skiing. So, I recommend reading Cross-Country Skiing to Winnemucca Lake for more specific information regarding this route for cross-country skiing and snowshoeing. These are two poster designs I created based on photographs I took while hiking the trail to Winnemucca Lake. 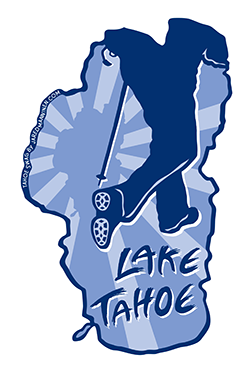 You can purchase them (and other Tahoe Swag) at my RedBubble account. There are many other products available, in addition to posters, so please check out my Lake Tahoe-related art & designs. Although the Lake Tahoe region did not experience a lot of snowfall at the beginning of the Winter 2017/18 season, Carson Pass (as usual) had quite a bit. During the week of December 4th, I cross-country skied three times from Carson Pass to Winnemucca Lake. The snow was wind-scoured and crusty in places, but there was plenty of coverage everywhere.